It's time for another challenge at ColourQ. 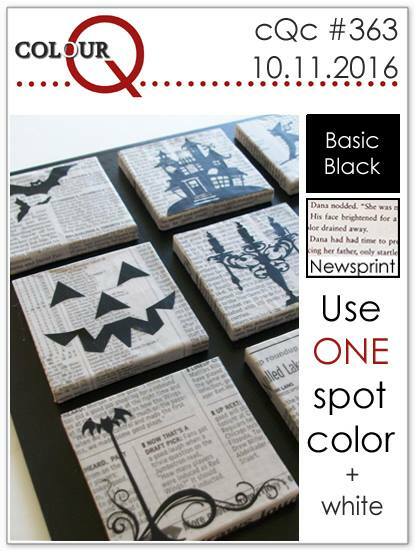 This week, our color scheme is black, newsprint, and one spot of color. You will notice something strange about my card. Where is the newsprint? That is a very good question. I completely missed that part of the color palette, even though I can see it is right there in front of me. My fellow DT members have been so kind and supportive, and encouraged me to post this card anyway. So, here is my card--pink with a faint grey ribbon, and one of my favorite sentiment for Breast Cancer Awareness month. 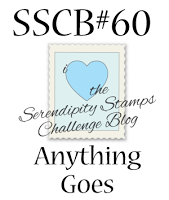 I am also entering this card at Serendipity Stamps Challenge Blog #60: Anything Goes. Please head over to the ColourQ blog to see more inspiration from the Design Team. I am sorry that my card is not going to provide you with any ColourQ inspiration this week, but perhaps it may encourage you to do your monthly breast self exam. I hope you will play along this week. I'm so happy you decided to post it Joyce!!! It's beautiful! I love the floral border surrounding the wonderful sentiment!! I think it looks fab without the newsprint and we all miss something sometimes! I'm so glad that it isn't just me who misses things, and I'm pleased to see your lovely card even if it doesn't have the newsprint Joyce. Fabulous framing and I love the pink floral background. love how you've made a stamped frame around the sentiment. I'm glad you posted it anyway because it's gorgeous! I love that floral frame - so pretty and highlights the brilliant sentiment perfectly! It's so lovely, Joyce! I think the pretty floral border is so much better than newsprint! Very elegant and beautiful card! Very inspiring! LOL about the missing newsprint. Great card Joyce! I love that background stamp and it looks wonderful as a frame, Joyce. Isn't it great to be on a team that forgives little goofs like that? I'm glad your fellow DT girls encouraged you to post this card...The sentiment is awesome, and I love the pretty pink pattern on the background! You always turn out the most gorgeous cards, Joyce...Love it! Lovemboth your card and your sentiment! Its beautiful Joyce! Your pink stamped frame from Serendipity Stamps is perfect! Fun to see you playing along in the Serendipity Stamps challenge, good luck ! This is so pretty Joyce! I love the frame you created! The pink floral is perfect with this sentiment!